Join us for an art-filled stroll down Uptown Main Street to celebrate springtime. 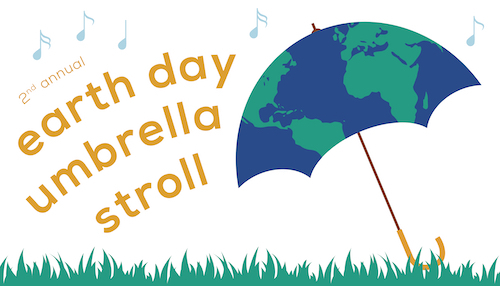 We’ll brighten up the street with decorated umbrellas, enjoy live music and visit art activations crafted by local artists and community groups in local businesses before heading to Upshur Park for a small Earth Day celebration and refreshments. We hope you’ll join us at 14th and Decatur, outside of Andromeda Transcultural Health, at noon to learn more about their recent renovations and enjoy live music before heading down 14th Street to Upshur Park. At Upshur Park, we’ll have a number of earth day activities including plants for you to take home, recycled art and food donated from local restaurants. We can’t wait to see you for a few hours of Earth Day fun on April 20th! Bring your decorated umbrella and your dancing shoes! Have questions or want to participate? Send our Executive Director an email at info@uptownmainstreet.org!